Green Drinks Edmonton is a simple, unstructured event that brings together environmentally-minded Edmontonians in a relaxed, agenda-free evening of networking and great conversation. 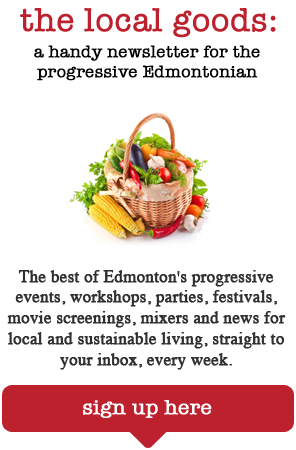 In Edmonton, we do Green Drinks with a slight difference: the events are themed to bring interested people and local experts together, to facilitate introductions and foster collaborations. Whether you work in the environmental field or are just breaking in, it’s a chance to mingle with a lively mixture of people from NGOs, academia, government, and business, share information and make friends. Although Green Drinks Edmonton is an organic, casual event, many people have found employment, developed new ideas, made business connections, and had moments of serendipity! Bring your friends and ideas – everyone is welcome! The provincial election is coming up, and we want you to ask questions and be informed! Mix and mingle with other Edmontonians and discuss the issues that are important to you this election. Our featured guests will be discussing a variety of topics that are important to them during the election. Read blog posts about past and upcoming Green Drinks events. Green Drinks Edmonton is part of the Green Drinks International movement, organized in Edmonton by The Local Good. Nov 6th 2013 – What’s Missing in Edmonton?